While I was doing my usual walk around the floor at last year’s Global Gaming Expo to look for interesting things to photograph, an unusual machine caught my eye. After several days of seeing slot machine after slot machine from different manufacturers, with a few touchscreen skill-based games mixed in, I was very pleasantly surprised to see what looked like a true arcade racing game sitting in the middle of the showroom floor. Shocked that it wasn’t crowded and that there was an open seat available, I sat down and had the most fun I had at the show. This year, I wasn’t so lucky. When I got to Synergy Blue’s booth, #2811, at this year’s G2E, I had to wait my turn to kart around the boardwalk racetrack I had had a blast at last year. However, getting the chance to watch other people play the updated Lucky Karts was interesting in its own right. Lucky Karts is one of the more difficult games at Synergy Blue’s booth, and not everyone had success at it. But I saw one driver laughing even as he smashed into wall after wall, which is a success in its own, especially for Synergy Blue. “One of the biggest hurdles of skill-based gaming is to make sure there’s something for everyone,” Georg Washington, CEO of Synergy Blue, told me. And boy, do they have something for everyone this year. Dwarfing the four games they had last year, the company has fifteen new and fully playable titles available on the G2E floor. 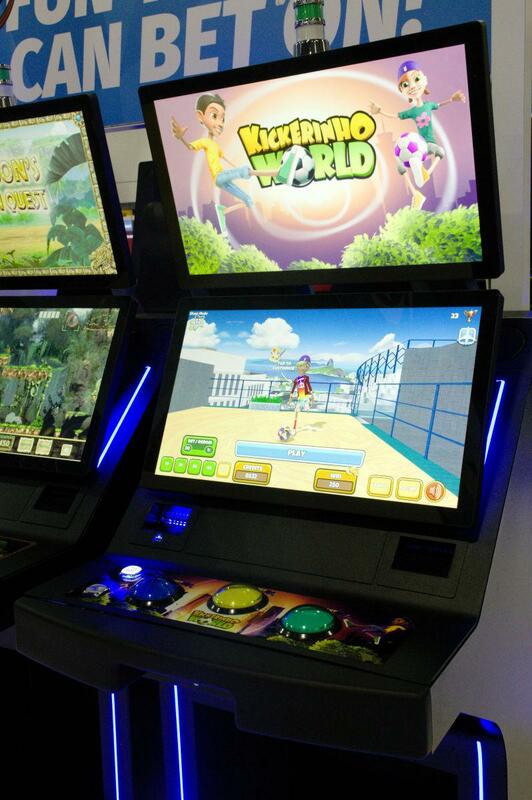 All of the titles run on Synergy Blue’s Hybrid Arcade Wager-Based Gaming (HAWG) system, meaning all the titles can run as Class III (Class II in progress). This sense of variety is fairly similar to how slot manufacturers design their machines to vary in theme and bonus structure, but Synergy takes it a step further by building fundamental differences into the gambling mechanic. For example, Candy Cash, one of the new titles revealed this year, may look similar to Safari Match, one of Synergy Blue’s earlier titles, at first glance, since they’re both match three titles. But in Safari Match, the bonuses are earned by matching specific numbers of tiles to fill up potion bottles, while in Candy Cash the bonuses are earned based on how well the player completed the level. Many of Synergy Blue’s games new titles also offer progression, a feature nearly unheard of on the casino floor. Instead of presenting an endless loop of gambling that continues until the player feels their luck (or money) has run out, games like Safari Match are level-based, even offering players the option of saving their progress to their players’ card, which, much like a standard video game, allows them to continue where they left off in the future. While earlier levels can be completed by most players with little trouble, the increasing difficulty of the later levels, combined with the player’s sense of progress through the jungle, keeps players glued to their chair longer. In fact, in Washington’s experience, the average player plays for about an hour. Not everyone can be a winner, but such extended playtime allows players to feel like they got a good value for their money. Washington also said he’s been able to gather valuable information about his machines in the real world since last year’s show, since Synergy Blue placed its machines on the Augustine’s casino floor in Coachella, California, this past April. The idea that manufacturers should be looking to develop skill-based games solely to attract millennials is a misnomer. Sure, certain machines, such as Lucky Karts and Star Horizon, a 3D space shooter, may be more appealing to millennials who might have grown up playing similar games in the arcades. But I saw people of all ages lining up at Synergy’s booth for the challenge, and Washington says he sees the same when he visits Augustine Casino. 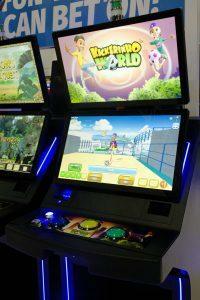 What Synergy Blue is experimenting with is a balance between addictive arcade difficulty and traditional casino fun. That makes their games compelling not only because of the possibility of winning money, but because of the feeling of accomplishment in successfully completing a level and the desire to keep progressing which is inherent in all traditional arcade games. In just their second year at G2E, Synergy Blue has progressed from having a few fun games in their booth to offering an impressive ecosystem of entertaining and varied titles. Let’s hope I don’t have to wait until next year’s G2E to play their games again.